When thinking of losing weight, many people turn to running, biking or other types of cardio. However, weight lifting has incredible weight-loss possibilities. In fact, two sessions of heavy lifting per week can result in 3 percent less body fat. That’s because you continue to burn calories even after you have stopped lifting weights because muscle requires more calories to maintain than fat. Whether you can work out five days per week or just two, by sticking to a regular schedule you can lose weight with weight lifting workouts. Warm up by walking or jogging for 10 minutes before working out. Work your chest and back one day per week. Work your chest with decline bench presses, flat bench presses, dumbbell flyes and cable cross overs. Tone your back with dumbbell deadlifts, bent over dumbbell rows, t-bar rows and lat pull downs. 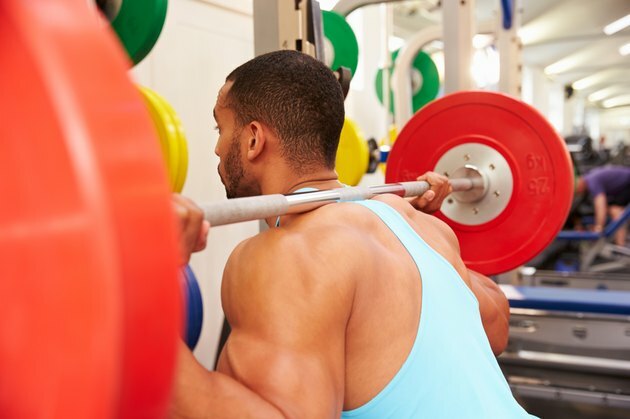 Do barbell squats and walking lunges to work your quads one day per week. On the same day you should include abdominal work by performing crunches. Tone your abs and delts one day per week. Perform Arnold presses, dumbbell shoulder presses and dumbbell lateral raises for your delts. Do crunches and hanging knee raises for your abs. Complete biceps curls and one-arm preacher curls to tone your biceps one day per week. On the same day work your triceps with pushups and tricep dips. Work your hamstrings and calves with seated leg curls, lying leg curls and standing calf raises. Cool down by walking or jogging for 10 minutes after working out. Perform situps, crunches, lunges, preacher curls, seated calf raises, triceps curls, shoulder shrugs, seated leg curls, pullups, leg raises and pushups one day during the week. Do an additional 15 minutes of cardio, divided into five-minute sessions between weightlifting exercises. Rest at least 48 hours before performing more weight lifting exercises. Complete knee raises, seated rows, tricep dips, leg presses, standing calf raises, shoulder raises, crunches, leg extensions, lat pulldowns, chest flys, upright rows, dumbbell lat raises and planks on a different day of the week. Do an additional 25 minutes of cardio, divided into five-minute sessions between weightlifting exercises. Cool down by walking or jogging for 10 minutes after you are finished working out. Talk to your doctor before starting a new exercise program.